The best way to arrive at a meeting prepared. 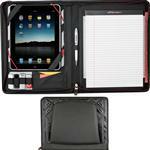 This etech journalbook holds your tablet and a pen and paper! Customize this etech journalbook with your corporate logo to really make a classy statement either for your employees or as a gift for your clients! Italian ultrahyde with pen loop and blank pages. Fits all iPad sizes. A RUSH PROMOTIONAL BOUND JOURNAL. FREE 1-DAY RUSH PRODUCTION AVAILABLE! Available Colors: Black, Terra Cotta and Navy. Available Imprint Options: Deboss. Other methods available - inquire. 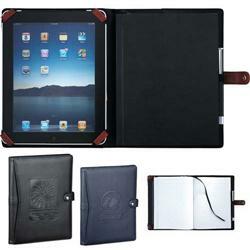 Italian Ultra Hyde, Pedova, Journal, Padfolio, Writing Pad, iPad, Tablet.